In a firefight, you never want to be the first to run out of ammunition. The Aker 910 A-Tac Double Magazine Pouch provides space for two additional magazines, allowing you to stay in the fight for longer. It is made from tough heat-molded ballistic nylon, allowing it to resist the wear and tear of law enforcement use with ease. 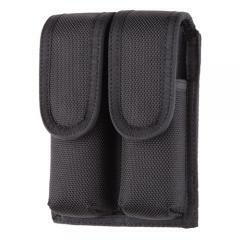 It can be worn horizontally or vertically on the belt to suit your tactical needs, and its secure top flaps keep the magazines in place while still allowing rapid access when needed. It features a dual fastening belt slide system that uses both a snap and a Velcro hook and loop fastening to provide a very secure fit on the belt, and fits a 2 or 2.25 inch duty belt.